Having graduated from Leadership Minneapolis at age 24, a year later Michael McCall was President of The Depot Development Company and with partner Steven Shapiro, secured venture capital from the Wheelock Whitney, Jr. family and $6 Million in land acquisition funding from the Minneapolis Tribune and the Soo Line Railroad. 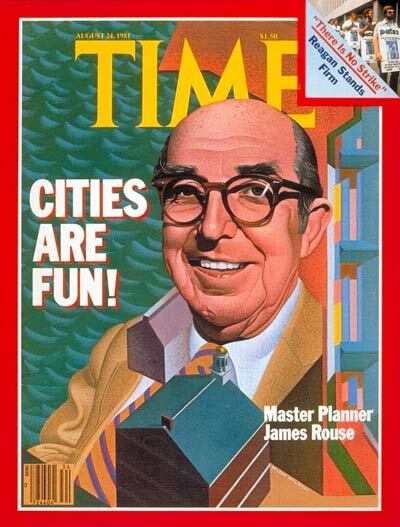 James W. Rouse is best known for his Boston's Faneuil Hall and Baltimore's Harborplace Festival Marketplace placemaking developments. From 1982 to 1992, Michael McCall worked for Mr. James W. Rouse, as Vice President of Development, where he developed Festival Marketplaces, led a multi-year joint venture with The Walt Disney Company, and conducted international consulting. After the development of millions of square feet of malls, the success of Festival Marketplaces Faneuil Hall in Boston and Harborplace in Baltimore, the development of the 14,000 acre Columbia, Maryland new-town, and his Time magazine cover story, Jim Rouse gathered Rouse Company alums and a younger generation to train under the master, at The Enterprise Development Company. As a young developer in Minneapolis, having researched James Rouse’s Faneuil Hall in Boston & Harborplace in Baltimore, and having studied everything Disney since he was a boy, Michael McCall wanted to work for either landmark developer; both of which crafted places that profitably captivated the public. Michael decided to write Mr. Rouse, after which he called Mr. Rouse, and then he called Mr. Rouse, again. Not only did he get the job, but in beautiful irony, Mr. Rouse gave Michael the opportunity to work with The Walt Disney Company. In 1989, Disney’s President, Frank Wells, asked Jim Rouse for advice on the then challenging Pleasure Island. Mr. Rouse asked Michael McCall to recommend a solution. Michael’s answer was to leverage the whole place, charging guests for a nightly street party. The strategy of "Timeline Design" was used to conceptually plan a completely new city; which like all great cities, would exude the "Palimpsest of Place," the evolutionary vestiges of economic geography refecting the transformation from village, to town, to city. Mr. Rouse gave Michael the opportunity to lead the international consulting primarily in the Pacific Rim countries of Japan, Singapore and Australia. Michael also worked in Spain and England. The project depicted here was for Shimizu, one of Japan's largest construction companies. The Conceptual Development Strategy was provided to Nippon Steel, the land owner of a 600 acre site on Osaka Bay, as gesture of goodwill from one large Japanese company to another. Whole Leadership: What is past, is prologue. Where Entertainment, Information and People Flourish® © 2019 Strategic Leisure, Inc.
All corporate names and symbols – other than Strategic Leisure, its logo & slogan – are the property of the respective entity.